In June, Good Time Design solidified its stronghold of the East Village with the opening of Southpaw Social Club at the space formerly occupied by El Vitral. Teaming up with Top Chef alum and chef/owner of R Gang Eatery, Rich Sweeney, as consulting executive chef, the gastropub focuses on social dining with an array of shared plates and modernized, classic-Americana inspired dishes. With a sophisticated bar list that includes over 30 craft beers, an extensive wine selection, cocktails by Blind Tiger Cocktail Company, and an amazing back patio looking out onto Petco Park, Southpaw is certainly a destination for anyone looking for a fun, yet refined experience in the heart of downtown San Diego. 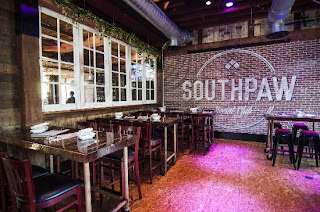 The interior of Southpaw screams saloon with its wooded decor and comfortable ambiance. Distressed barn timber, industrial aged steel, historic brick, and lacquered sawdust flooring are just some of the many distinct features of the interior design. The venue includes a smoke-free outdoor seating area on J Street, a back patio pretty much in Petco Park, and two dining areas inside (the front designated as family friendly), all coming together for a layered personality. The menu at Southpaw is a collaboration between Sweeney, executive chef Chris Trevisin (formerly of Vintana) and Todd Nash of the neighboring Blind Burro. The eclectic offerings include grilled flatbreads, social plates, supper club style entrees and classic sandwich and salad combinations. Long wood tables encourage patrons to socialize and share their experiences. We recently joined new friends for an entertaining evening at Southpaw and began our meal with a sampling of food flights. There are three different flights to choose from, allowing the diner to pick a mixed variety of offerings, from cured meats and unique artisan cheeses, to veggies, hummus and flavor packed nuts. These medleys come served on a cutting board and are perfect options for social snacking. Next we enjoyed Southpaw's take on the classic Cobb salad - the Mixed Bag - a cornucopia of ingredients including fresh greens, seasonal veggies, hard boiled egg, crumbled bleu cheese and crispy pork belly, tossed in a charred sweet onion vinaigrette. This loaded salad is a meal in itself. The Chicken on Fire flatbread is Southpaw's take on a Buffalo chicken pizza, and tops a paper thin crust with roasted garlic, fire roasted red peppers, mozzarella, red pepper pesto, feta, basil and juicy pieces of chicken. The Fig & Pig flatbread combines shredded bacon, gruyere cheese, California figs, baby arugula, caramelized fennel and onions with honey balsamic sauce for a sweet and smokey option. Southpaw's flatbreads are light enough to enjoy with any meal, and also the perfect compliment to a San Diego craft beer. From the mains, you can't go wrong with the Upstream Salmon. Sided by a summer succotash of wild mushrooms, tomatoes, sweet white corn, crispy leeks, edamame, and topped with a lemongrass and vanilla bean burre blanc, this dish is comforting and hearty while remaining a healthy option. We also devoured the 8 oz. grilled hangar steak, which comes with a dressed arugala salad, balsamic onion jam, and a celery root and yukon potato gratin. Atop the protein, the star of the dish is perched - a bleu cheese compound butter that ties everything together. Layer that fork with what comes on this plate and embrace that savory goodness. 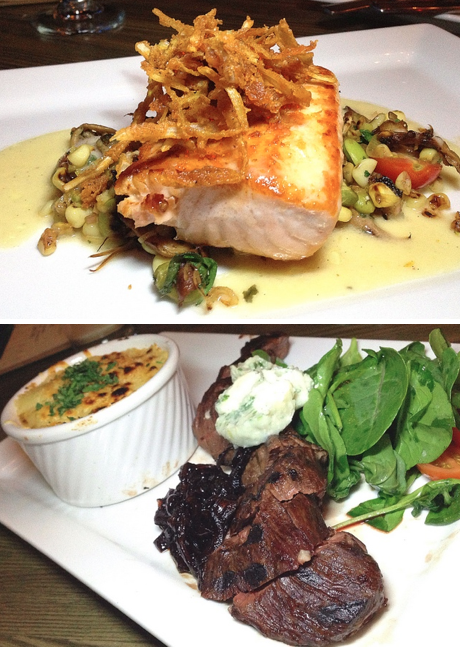 Southpaw only offers two desserts, but one is all you need if you do it right. We may not be dessert enthusiasts, but bread pudding always gets us excited, and Rich Sweeney knows his bread pudding. 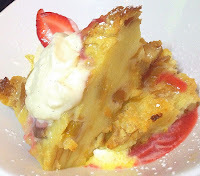 We loved this version and highly advise digging in to its moist, pillowy sweetness. 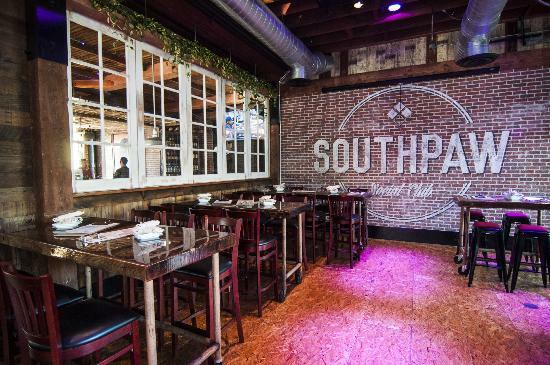 Southpaw Social Club is one of our new favorite spots in Downtown San Diego. Don't miss social hour M-F from 4-7PM where you get $4 off flatbreads, $5 calls, $2 off draft beers and 1/2 off bottles of wine! Be sure to tell 'em SanDiegoVille sent ya!